Caroline Pineau's teaching is infused with deep skill, knowledge and heart. Each student who walks into her class is seen, attended to and appreciated. With this foundation, tremendous growth can occur! Caroline heartily encourages her students to cultivate physical and mental fortitude through yoga, while utilizing her anatomy expertise and personal experience of navigating injury to tailor the practice safely to all levels. Sound alignment, clear instruction, intentional sequencing, and mental focus are the pillars of Caroline's classes; warmth, inclusiveness and skilled hands-on assists complete her signature style. Her intention is for students to develop a treasured awareness of their own unique anatomy, and to gain access to quiet and calm. Drawn to the practice for its holistic healing, physicality, and capacity to cultivate equanimity, Caroline completed her first 200-hour training with Frog Lotus Yoga in 2010. She has been teaching full-time ever since, and graduated from Boston Yoga School's 500-hour Advanced Teacher Training in 2015. Always a student, she continues to study and work closely with her mentor Ame Wren and other inspiring teachers. Caroline's personal commitment to teaching and community is reflected in her vibrant studio, The Yoga Tree (www.theyogatreestudio.com) in downtown Haverhill, MA. Since opening in 2010, The Yoga Tree has twice been awarded "Best Yoga Studio-Readers Choice" by Northshore Magazine and has become a go-to practice space on Boston’s North Shore. The studio offers a full schedule of weekly classes with talented teachers, frequent workshops with some of New England's most sought-after guest teachers, and specialty teacher trainings in children's and prenatal yoga. Beginning in August 2017, the studio will also host a full 200-hour Boston Yoga School teacher training co-directed by Caroline and Ame Wren. A few times per year Caroline takes her yoga on the road to lead retreats full of laughter, connection and deep learning in beautiful locations - always a special experience! Off the mat, Caroline is an artist, working with paint and mixed media. She lives in Haverhill, MA with her cat Boots, two dogs Reese and Mango, and her wonderful husband Adam. She loves to spend time with family and friends, be in her garden, and adventure in nature. Longtime Portsmouth, NH resident, Julia Tirabassi has been teaching Yoga professionally for 12 years in the seacoast region. As a former personal trainer, it was her passion for movement and an on-going fascination with the body's unlimited potential that led her to a full-time career as an independent Yoga teacher. She formed her own solo-preneur business, Lotus Groove Yoga, in 2006. A self-proclaimed yoga enthusiast, asana addict, alignment geek, and handstand fanatic, Julia infuses all of her teaching with an impassioned knowledge of bio-mechanical movement, anatomy, injury prevention, and an overall zest for playful vinyasa adventures. Julia's had the immense pleasure of working with a wide range of yogis over the course of her career. Students of every experience level, from athletes to seniors, have benefited from her distinctive style, alignment-based methodology, and avid zeal. Eternally true to her days as a fitness enthusiast, Julia's teaching style continues to include plenty of athleticism, but has evolved into a unique "special blend" of creative physicality, sweaty sweetness, mindful movement, and keen attention to alignment. In each and every moment, Julia strives to share continuously fresh, contemporary, and creative ways to guide students towards manifesting their personal expression of empowered grace. Practicing yoga and meditation for ten years, teaching professionally for five years, I aim to bolster the health of my community, offering physical benefits as well as the spiritual and emotional grounding that practices of yoga and meditation can provide. I believe strongly in the powers of physical, emotional and spiritual wellness not only as indicators of social welfare but as the essential building blocks of safe and vibrant communities. My teaching is grounded in the belief that healthy, compassionate people are more able to engage in the vital social work that our communities so desperately need. In addition to the ‘general public’, I work with diverse populations, including adults healing from traumatic brain injuries (TBI’s), urban youth ages 6-12, individuals recovering from physical injuries and/or with physical limitations, as well as pregnant and postpartum women. In addition to teaching yoga, I am a working visual and performance artist and a social activist. I am pursuing a degree in Fine Arts and Education at Lesley University. I live on a farm north of Boston Massachusetts with my three-legged dog, Bunny. After several years in the corporate world, Kelly found she wanted a more active, engaging and peaceful career path, and decided to make her passion for yoga a profession. Kelly has completed Ana Forrest’s Foundational Teacher Training, known for addressing today’s stresses and challenges using intense pose sequences, compassionately taught, to develop skills in awakening each of the senses. Kelly strives to provide a space where students can safely explore and challenge their bodies and unplug from the outside world. She stresses linking breath with movement and listening to what the body needs. Music, physical adjustments and compassion are all an integral part of her classes. Vinyasa, Forrest and Power yoga styles, as well as her students influence her. Pam began her yoga journey seven years ago after an injury left her unable to continue with her regular exercise routine. Following her first class at the Yoga Tree, she experienced an unexpected emotional release and ensuing sense of nourishment. 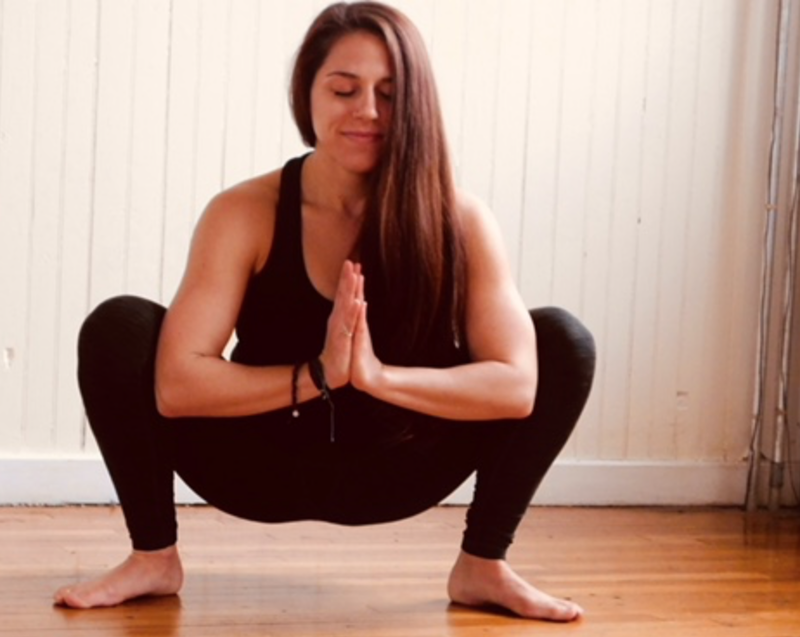 This powerful connection to her practice has remained and her commitment to yoga has grown, as she has completed the 350 hour YTT certification with Julia Tirabassi of Lotus Groove Yoga and is now a teacher at the studio where her journey began. Pam enjoys teaching alignment based asana, linked with fluid movements and breath. She prioritizes creating a welcoming space that is safe, inclusive, and accessible to yogis at any level. Kerrie has always had a love of expressive movement and with the practice of yoga now moves through life with greater ease and joy. Yoga, with its endless process of self discovery, has inspired and empowered Kerrie in many ways throughout her life. Yoga inspires Kerrie both as a student and as a teacher to experience life as it happens, honoring where you are in each moment, breath by breath. Forever curious Kerrie loves being upside down - inversions showing a whole new perspective, learning from both finding balance and falling, to be open to new possibilities. Kerrie strives to honor the roots and origins of yoga emphasizing mindfulness, alignment, and connection to breath. In Kerrie's classes you can expect a balance of strength and grace as well as laughter. Kerrie completed her 200 hr teacher training at Back Bay Yoga in Boston with Ame Wren and Lynne Begier. Eternally a student, Kerrie continues to take classes and workshops with many of the amazing yoga teachers that the Boston area has to offer. She is currently taking part in a teacher mentorship program with Ame Wren at North End Yoga in Boston. Kerrie is grateful to have the opportunity to share the gift of yoga so her students can cultivate it into their own lives, ultimately becoming their own teacher, intelligently guided from within. Kerrie is also the mother of two amazing kids and was drawn back to the practice of yoga through prenatal yoga. Here she found an amazing sense of community and a strong connection to her physical as well as more subtle energetic bodies which reignited her love of yoga. With a passion for yoga on and off the mat Kerrie leads with an open heart and an open mind! When she's not practicing yoga Kerrie can usually be found with a chai in hand, enjoying New England's ever changing weather, groovin' to her own beat. Breathe, expand, challenge and nurture yourself, discover something new, and maybe even laugh a little (or a lot!) - these are the intentions that Checka holds for her yoga students each day. Checka is deeply honored to share the practice of yoga, and passionate about her work. She teaches an upbeat Vinyasa Flow class, offering fresh and creative sequencing along with compassionate and skilled assists and adjustments. She provides smart and safe pathways to deep openings and peak poses, so students feel both exhilarated and supported in their practice. Moments of challenge and intensity are woven together with times of deep relaxation to keep yogis curious, engaged, and full of breath! Checka’s yoga journey began in 2006, when she moved from Cambridge, MA to the Big Island of Hawaii to live and work at Kalani Yoga and Wellness Retreat. In this setting of stunning natural beauty, she began to deepen her own practice, along with her love and appreciation for the strengthening and healing nature of yoga. After two years of serious practice, Checka traveled to Costa Rica to complete her 200-hour Yoga Alliance certification with Jacqueline Heisel of Frog Lotus Yoga. She then returned to the Boston area and has been teaching full-time ever since. Checka has completed additional training with Shiva Rea, Alice Senko and YogaThree founders Chanel Luck, Bonnie Argo, and Roberto Lim. She continues to be gratefully inspired by the guidance of her yoga mentors as well as the lessons she learns from her students each and every day! Kristin Bernier believes that the practice of yoga brings grace, strength and overall health to life. The joy and challenge of yoga has time and time again brought her back to her mat. Kristin completed the 200 hour yoga teacher training program at The Yoga Loft under yogis Jen Ryan and Nicole Grant. She has practiced at Sacred Waters Ashtanga Yoga under yoga master Karen Noble in the Hawaiian island of Moloka’i. Kristin is a licensed massage therapist and polarity practitioner who believes that yoga is the key element to bringing the spiritual, mental and physical body together. Kristin’s classes are full of energy and her sequences are creatively constructed to open the body to work into a peak asana. OM. Shauna originally turned to yoga purely for physical reasons, however she learned quickly that there was a lot more to it than an increase in flexibility and strength. While those were obvious results from practicing yoga, the feeling of peace and happiness she felt after class was not expected. She was hooked. After six years of practicing, in 2014 she enrolled in Boston Yoga Schools 200-Hour RYT program to learn more about the mind body connection and the clear benefit of that relationship. Under the tutelage of Ame Wren, Brenna Matthews and Joanna Benevides, Shauna learned the intricacies of thoughtful sequencing, alignment based asana and methods to increase both strength and flexibility. She welcomes all levels and encourages a non-judgment atmosphere, both towards others and yourself. She looks forward to seeing you on the mat! Casey has always been an active person, constantly finding new ways to challenge herself. This included picking up skateboarding in her early 20s, eventually resulting in a torn ACL and meniscus. She found yoga in order to ease back into movement and regain strength and mobility. A debilitating and devastating injury turned into a life changing gift in disguise. The flow, the music, and the challenge initially attracted her to the practice, the peace of mind and fresh perspective kept her coming back. Casey completed her 200 hr training at Back Bay Yoga (Now Yogaworks Boston) in 2015 with her teachers Lynn Begier, Ryan Cunningham and Renee LeBlanc. She began teaching while working her corporate job in the city. Recognizing that yoga was a strong and significant passion of hers, not only as a lifestyle but as a career, she left her corporate position in 2017 to pursue teaching full time. Since then she has continued her education through self study, workshops, and completing an advanced training for teachers with Ame Wren. She is looking forward to taking her 300 hr soon. Having an interest in structure and anatomy, her sequences are well thought out in order to open the body strategically while also leading students through mindful transitions, a playful flow and opportunities to try something new! In her teaching, Casey seeks to create a safe space for growth, encouraging yogis to find their limits and push past what they thought was possible. Yoga provides an opportunity to break things down and be more mindful, not only on the mat but in all areas of life. With dedication the practice can open up new perspectives, on and off the mat. Casey has learned to have patience with herself and has gained a much greater appreciation for process. She teaches to share this gift and help others to feel better in the life they lead. She wants her students to work for the sense of pride they feel for even the smallest of shifts. Joe discovered yoga 15 years ago at a gym in Nashua. Seeking a practice to balance his workout regimes and stressful career, the closing mantra "take only what you need" was refreshing and empowering. A constant traveler and global citizen, Joe practices many yoga styles wherever his travels take him. Inspired by many teachers and fellow yogis over the years, Joe completed his 200 hour Yoga teacher training at Kripalu in Lenox, MA under teachers Randall Williams and Coby Kozlowski. Joe believes a yoga practice creates a deeper connection to yourself and others thru compassion and non-judgment; building the relationships we need to cultivate a more mindful and meaningful life. Joe’s authentic voice, energy and dedication to a safe environment for all, encourages self-inquiry and awareness, providing a space for your inner voice and self to shine through. After studying dance throughout her life, Jaime-Lyn entered her first yoga class in 2005, and immediately felt at home. Having spent several years in Southern California, and now living in the Boston area, she is grateful for how these two yoga communities have shaped both her personal practice and teaching style. Jaime-Lyn completed her 200+ hour teacher training with Boston Yoga School, under the guidance of Ame Wren and Brenna Matthews. She is an approved Radiant Child Yoga Teacher, having studied with Checka Antifonario. Recently she completed her prenatal yoga training with Bec Conant at Om Births, and is working toward postnatal certification. Both on and off the mat, she strives for balance, and this is carried into her teaching by a focus on strength and alignment, while fostering a sense of curiosity. Outside of her yoga practice, Jaime-Lyn enjoys traveling, usually in pursuit of the next rock to climb or sunset to photograph. Oh, and ice cream. Jennifer Desrosiers wants to live in a world filled with endless miles of twisty mountain bike trails, french press coffee, luxurious car camping, and effortless handstands. As a certified holistic health and wellness coach, 200 RYT yoga instructor, and self-proclaimed real food junkie, Jennifer believes great health is a synergistic balance of a healthy diet, tons of self-love, passionate relationships, and powerful movement. Jennifer is the founder of Laney & Lu, a vibrant food community cafe and organic juice bar, located in downtown Exeter, NH and co-founder of Wild Adventurous Life, a wellness and lifestyle media company. Yoga, for Jen, embodies the true spirit of adventure, and her classes are energetic, alignment-focused, and powerfully challenging for yogis at any level. She encourages her students to practice with an open mind and an open heart. Kacy grew up with dance and athletics, but it was not until she walked out of her first yoga class did she realize how yoga began to change her mind, body and spirit. She dabbled in Kripalu, Bikram and Restorative Yoga styles for years but landed at Living Yoga in Concord, NH for her 200RYT studying Ashtanga. She teaches locally in MA and NH and has also had the privilege to teach in India and Sri Lanka which helped her to deepen her roots. During her graduate school studies in the Science of Integrative Health she began to explore a deep mind body connection and the remarkable benefits that simple awareness can bring to one’s life. Kacy aims to create an inspiring and open space for exploration where students can face their edge with compassion and rid expectation. She invites her students to move, laugh, reconnect, but more importantly to find a home within themselves. I have been practicing and studying yoga for many years, and I love how it has transformed my body, mind and life. I believe that the human spirit has unlimited potential and that the human experience is ever changing, both on and off the mat. I want to share the gifts and insights that I've gathered with others as we build strong yet light hearted communities unified by love, respect and yoga. My teaching style is rooted in formal training influenced by different styles of yoga and inspired by self discovery and my love for the physical practice. In my classes I combine traditional principles and contemporary transitions. There's physical challenge, but the goal is to create ease, stability and self awareness. I strive to teach with authenticity and creativity and encourage my students to bring their own personal intention to their practice and to learn and find inspiration in every class. My flows can be intensely physical yet accessible as we synchronize the breath with the use of repetition and a progressive series of postures. The intentional structure and alignment, infused with intelligent and creative sequencing, allows students to enjoy the freedom of Vinyasa and motivates them to cross boundaries into the new and unknown, creating a sacred space to commune with the Self.